The monks’ rice pot remains with the people, if the people are miserable, have nothing to eat, if they have no freedom, if they live as slave, monks will also feel the hardship pinch. Therefore, monks whose duty is to save the humans, must teach and encourage people to find food to eat, to find clothes to wear, to find freedom for their country, to find independence and total peace. Tears of the people are those of monks. Posted originally by M. P.
Hem Chiev was born in 1898 to a modest farmer family in Oudong. At the age of 12, his father took him to study at Wat Ounalom under the guidance of Monk Chuon Nath who is one of his father’s friends. Young Hem Chiev studied well while serving monk Chuon Nath until the age of 16. Under his parents request, the young Hem Chiev decided to take the vow and became a monk at Wat Ounalom where he further expanded his knowledge of Buddhism under the guidance of monk Chuon Nath still. At the age of 20, monk Hem Chiev was ordained as Bikkhu at Watt Langka. He then went on to pass the exam to enter the Buddhist Institute in Phnom Penh. Achar Hem Chiev encouraged his students to study hard to liberate themselves from the yoke of the French colonial rule. 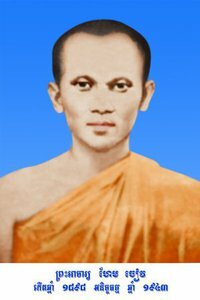 He also started the movement to preach Buddhism in Khmer rather than in Pali. As a member of the French opposition, Achar Hem Chiev kep contact with other Khmer nationalists at the time, among them: Pach Chhoeun, Son Ngoc Thanh, Chum Moung, Nuon Duong, and Sim Var. They all worked to find ways to free Cambodia from the French rule. Do not be a man of burden to the world (i.e. be useful in life). We must bring well-being to the present first because if we now have well-being, there will be well-being in the future as well. You must work, do not wait for fate. You can cross hardship only if you are determined. You can only depend on yourself (i.e. self-reliance). You must not frequent bad friends, you should not frequent friends with low life, you should frequent good friends, you should frequent people with high ideals. Unintelligent people will bring you actions that should not be brought up, they always bring you chores that are not of concern, they are people who are difficult to teach and bring back to the right path, when they are told about good behaviors, they become angry, they do not know about rules, if you do not meet them, or see them, it is best that way. You should not depend on someone else to feed you in life. At a preaching session where he spoke about independence, one man told him: “We want independence from France also, but we don’t know what to do.” Monk Hem Chiev told him back: “It is easy, as Lord Buddha told us: ‘The union will bring well-being in everything’”. On July 17, 1942, under the instigation of French spies, Achar Hem Chiev was arrested and unceremoniously defrocked. He was then thrown in jail by the French colonial regime working under the occupation of Japan. On July 20, 1942, a demonstration asking for the release of Achar Hem Chiev was organized by Pach Chhoeun. He was joined by about 1,000 demonstrators including several monks. In the melee which ensued, Pach Chhoeun was pushed inside the perimeter of the French Resident compound. French agents took this opportunity to close the door behind Pach Chhoeun and arrested him on the spot. Seeing this arrest, the monks started to fight against French police agents and their Vietnamese agents using their umbrellas. Meanwhile, the civilians who were present at the demonstration started to throw rocks against the French. The demonstration idea originated from Son Ngoc Thanh who wanted to show the Japanese (who then occupied Cambodia) the displeasure of Cambodian people against the arrest of Achar Hem Chiev by the French agents of the fascist Vichy regime, he would then ask the Japanese troops for intervention and obtain the release of Achar Hem Chiev. However, the fight and the arrest of Pach Chhoeun changed all Son Ngoc Thanh’s plan. Following the demonstration, several important Cambodian nationalists were arrested by the French after the demonstration. Accused of sedition (KI-Media Note: Villagers in Kratie who resisted forced evictions are currently charged of secession), Achar Hem Chiev and several other Khmer nationalists were sentenced to life in prison by the French colonial court, and sent to jail in Poulo Condor (Con Son Island) also known in Khmer as Koh Trolach jail. It was there that Achar Hem Chiev died. Rumors had it also that the French forced Achar Hem Chiev to sleep in lime which seriously affected his health (one of my uncle who then belonged to the nationalist movement told me about this rumor). On July 4, 1972, the Khmer Republic regime repatriated the remains of Achar Hem Chiev from Poulo Condor back to Cambodia where he received his final proper religious rite. His remain was then kept at Wat Ounalom. The following PDF edition of the biography of Ven. 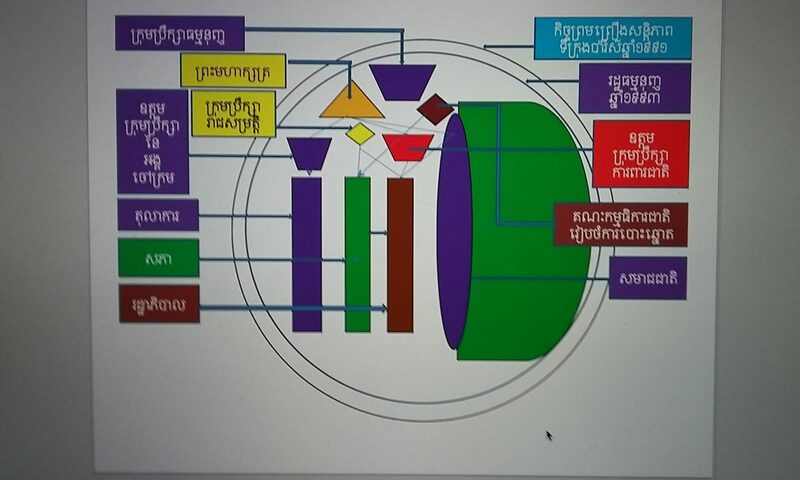 Hem Chiev was made available by Lok Ly Diep of Angkor Borei News. Please find below a copy of Lok Bun Chanmol’s book “គុកនយោបាយ – Political Prisoner” which provides an account of his life during Cambodia’s struggle for independence from France. In this memoir, Lok Bun Chanmol also provided a glimpse at the Poulo Condor (គុក កោះត្រឡាច) jail set up by colonial France to imprison those who demand for independence in French Indochina. Another famous prisoner in this jail is Ven. Hem Chiev, a Cambodian monk who was defrocked by the French for leading peaceful protest against French occupation. Ven. Hem Chiev died of forced labor at the Poulo Condor jail and his remain was only brought back to Phnom Penh in the 70s. The situation in Cambodia during that period is very reminiscent of today’s Cambodia where only one monk, Ven. Loun Sovath, dares to stand with those who were unfairly evicted from their homes. Furthermore, those who dare protest against the current CPP regime are summarily sent to jail in a tribunal charade. Almost 60 years after achieving independence, Cambodia is returning back to a tyrannical regime just like our ancestors suffered under the French colonial regime. This time around, the tyrants are the CPP and their leaders. Enjoy, read, learn and remember!